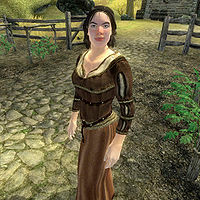 Maeva the Buxom is a Nord warrior living at Whitmond Farm just north of Anvil. Her husband, Bjalfi the Contemptible, recently ran off with a family heirloom, a leveled mace called Rockshatter, and she wants you to track him down and get it back. Since her husband abandoned her, Maeva tries her best to run the farm by herself, which means lots of work out in the open, although she still manages to find some time to relax. She gets out of bed at 6am, takes her breakfast in the house for two hours and then strolls around for one hour. At 9am, she exits the house, pulls out her rake and works the land tirelessly until she reenters the house at 6pm for a three hour dinner. The last three hours before bedtime at midnight are spent in a chair in front of the fireplace, where she reads the book Beggar Prince. She wears a set of ordinary lower-class clothing, consisting of a brown shirt, tan linens, and cowhide shoes. She carries around a cheese wedge, her book, the key to her farm, her rake, and a small amount of gold. If you have completed the related quest, she will also be armed with Rockshatter. Unhappy about the loss of her family heirloom, Maeva will angrily greet you with: "What do you want?" Not being particularly impressed with her husband's merits and deeply regretting that she chose to overlook her father's warnings about him, the first thing she will say to you is: "If you see my good-for-nothing husband, Bjalfi, tell him I want back what he stole from me!" If you end your conversation with her at this point, she will simply mutter: "Suit yourself." If you ask about her husband, she will explain her situation to you: "Perhaps you can help me. My husband's name is Bjalfi the Contemptible. My father said I was a fool to marry him, but I didn't listen. At our wedding, my father gave us a family heirloom as a gift: Rockshatter, a mace that's been in my family for many generations. Bjalfi snatched Rockshatter from our mantle and took off to 'find his fortune' with the local Marauder gang at Fort Strand. I want that mace back. Please, I don't think he's ever coming back, and I'd hate to lose such a precious heirloom to a gang of thugs." At this point, she will bid farewell with another plea for help: "Please bring back Rockshatter. It means a great deal to me." If you approach her again after this conversation, she will continue ranting about her husband: "That good-for-nothing husband's going to be very surprised if he crawls back here. Very surprised." She will then proceed to ask you about her family heirloom: "Found Rockshatter yet by chance?" After having fought Bjalfi and retrieved Rockshatter, you will get the following reaction from her: "I'd already convinced myself I'd never see Rockshatter again, but I was wrong. What's become of Bjalfi?" If you already killed Bjalfi and claimed Rockshatter without talking to Maeva, she will ask a similar question: "Goddess! You have Rockshatter already? And what's become of Bjalfi?" When you tell her the sad details, she will reflect a bit on her now late husband: "He was a good man when I married him, but greed took a hold of his heart. While I'm not happy he's dead, I'm glad he's at peace. Well, I'm just glad that it's all over and Rockshatter is back where it belongs in my family. I feel I owe you something for your efforts. Hmmm, yes. I feel it only appropriate that you have my dowry. I would consider it an honor." After completing the quest, Maeva will happily greet you when she sees you: "Ah, my savior. Back again for a visit are we?" Even though she's not grieving, her final words reveal that she is definitely ready to move on in life: "Now that Bjalfi's gone, looks like I'm available again. Back to the old dating game." She will end conversation by wishing you well: "May the Goddess watch you." This page was last modified on 3 April 2015, at 19:43.